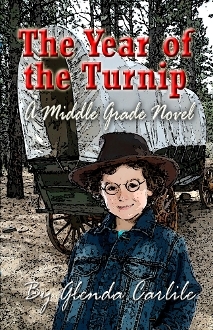 Twelve-year-old Caleb’s parents are pulling up roots and moving the family to a wild and unknown land. There, they will line up, with thousands of other people, to run in the West’s most amazing race. But Caleb has no idea what’s in store — dawn-to-dust labor, long dark nights, and crops that won’t grow. Their home is dug out in the side of a hill. Caleb can’t do anything to please his pa. Adding to his problems are blizzards, sickness, and a nagging four-year-old sister who will not mind. Worst of all, Caleb is plagued by terrifying dreams of encountering an Indian. To top things off, Caleb — who hates turnips — is in for a nasty surprise! Although not a native, Mrs. Carlile considers herself an "Okie" by interest and love. Born in Pennsylvania and raised in Florida, she knew little about Oklahoma before moving to the state in 1962. She attributes her love of Oklahoma history to her husband, Tom, a native Oklahoman. The wife of an osteopathic physician and mother of three daughters, Glenda is also known for her community and professional service including serving as the 1989-90 National President of the Auxiliary to The American Osteopathic Association. Her numerous awards include the Auxiliary to The Oklahoma Osteopathic Association’s 1988 Woman of the Year, the 1990 Distinguished Service Award from the Oklahoma State University College of Osteopathic Medicine and a joint resolution of commendation from the Oklahoma House of Representative and the Oklahoma Senate in 1989.